From the award winning Take That Tribute – Could it be Magic (formerly Thats Life) comes their newest show ‘The Jersey 4’ inspired by a recent visit to the West End & their love of all things ‘Boyband’ this seemed the most natural progression to make & perfect timing too with the new movie launched in 2014, bringing the Jersey Boys to the forefront once again! 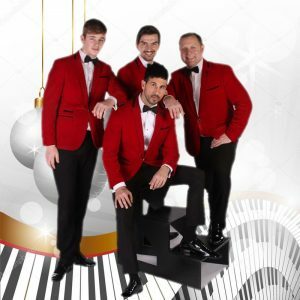 Taking a trip back in time to the original Boyband harmonies & those famous red jackets as they deliver their tribute to the music of Frankie Valli & The Four Seasons. Having perfected the vocals, the dance moves & all the biggest hits designed to get you on the dance floor & keep you there, the perfect cocktail for a great night. You will be surprised at how many of the songs you will remember, with just a short sample below to bring it all back to you!! !